Inspired by Chapter 6 'The King of the Golden Hall' in 'The Two Towers' by JRR Tolkien, Gandalf the White, Aragorn, Legolas and Gimli ride with haste to the Golden Hall of Edoras in the wold of Rohan. This colourful and expressive interpretation of the aforementioned section of Tolkien's 'The Lord of the Rings' was painted in ink and acrylic. The original painting is 40 x 30 inches. 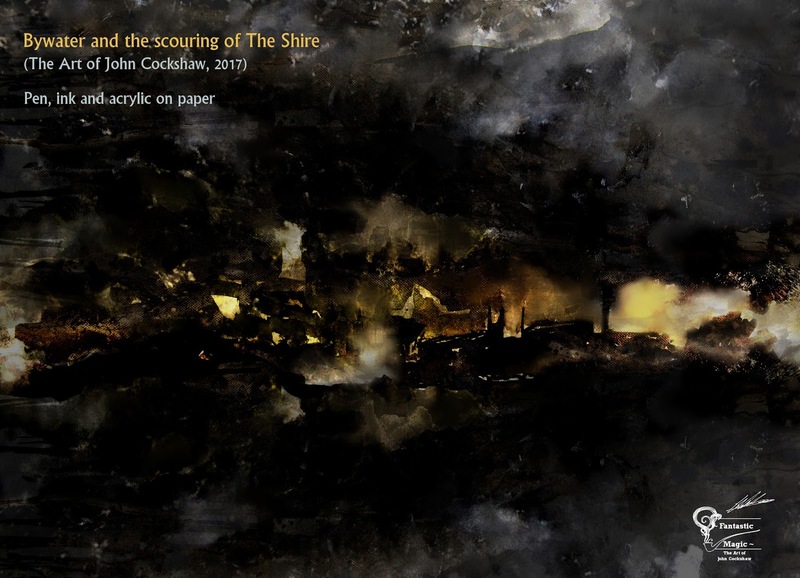 This latest artwork of mine takes inspiration from the penultimate chapter of 'The Return of the King' by JRR Tolkien, and the initial shock the hobbits feel at the spoiling of their homeland.